A Year of Being Here: Alixa Doom: "Cedarkin"
and a breeze blowing through me. I no longer buy tickets to anywhere. through the sun and mist of cedars. pushes up through cedar trunk. the quiet affection of cedar sisters. "Cedarkin" by Alixa Doom. Text as published in A Slow Dissolve of Egrets (Red Dragonfly Press, 2014). Presented here by poet submission. 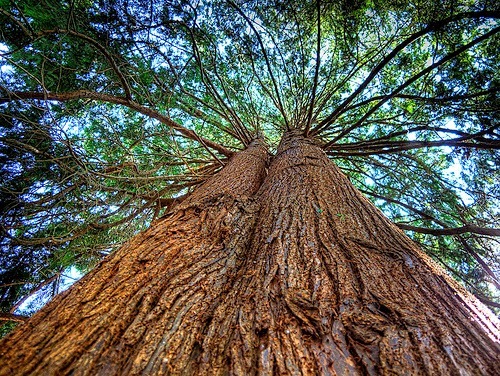 Art credit: "Western Red Cedar," photograph taken on June 13, 2009, in British Columbia (Canada), by Evan Leeson. Wonderful! I smile warmly and broadly at the fourth line, especially. Beautiful. Makes me want to go slow and wear seeds and starlight. "seed in my hair/and starlight on my skin"--so beautiful. I love "I no longer buy tickets to anywhere." I love "the quiet affection of cedar sisters," the title "Cedarkin" and "truer time."